Professional football is rather unique in that the higher up the profession you go, the less space you are given to work in. Compare that with a factory worker producing for an employer. They have their space protected and have guaranteed space to work in. An office worker has a desk in which to complete their tasks. As they get better they may progress through the ranks of their profession, perhaps to become a manager with a spacious office at their disposal. They apparently need this space to operate in order to operate at a higher level whilst the workers enjoy their guaranteed, if restricted work space. Football is different. As you progress through the game, generally you have your space taken away from you. At the very highest levels of the game space is at a premium and generally you have to find your own space or have a system set up to grant you some. Occasionally the opposition may cede some through negligence or by design. However, a general rule in football is that the more you progress in your profession the less space you have and you have to get used to operating in less space. Obviously you are well remunerated for this inconvenience so you’re hardly likely to take this to a union or refer the case to the Health & Safety Executive. Last season this blog complied a feature on DJ Campbell, charting the goals that he scored in the Championship whilst also looking at how he was settling in to the Premier League. A general observation made at the time was that during his goal scoring period in the Championship it was noticeable how much more space he had to execute his moves and make his decisions. Now Blackpool are back in the Championship it is noticeable how much space there is, especially in the box and final third. 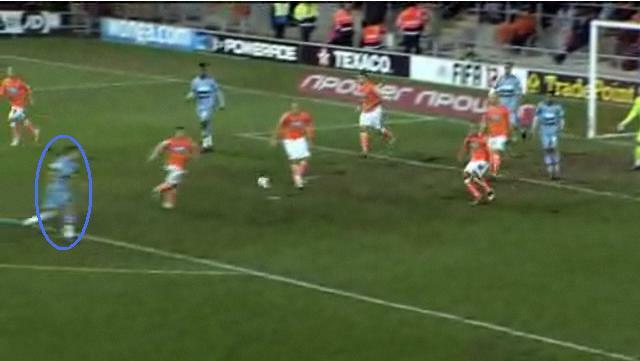 In recent weeks there have been a few goals occurring in Blackpool’s matches that highlight this issue of space and alongside this, some excellent play from a wise old professional who knows how to create space. First and foremost West Ham outclassed Blackpool from start to finish when they met the other week, however, when Gary O’Neil struck the third West Ham goal it stood out because of the time and space he was granted. 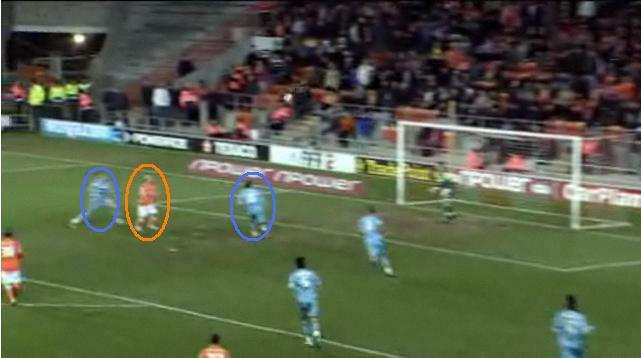 You can see below how he is on the edge of the area left all alone with Blackpool giving him all the space he needs to choose what to do. 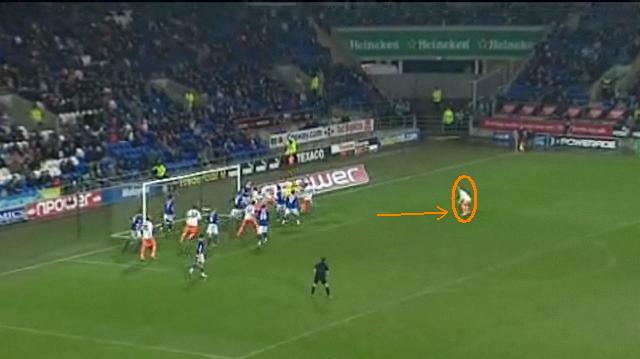 Gary O'Neil is circled above to illustrate the space he was granted by the Blackpool defence. This struck an uncanny resemblance to when Kevin Phillips struck against Cardiff last month. The Cardiff defence appeared to react slowly and space was granted to Phillips who guided the ball in to the goal with great technique and accuracy. You can see below how Phillips has almost seven if not eight yards of space to work in. The arrow indicates the movement Phillips made in to the space. When you’ve operated at the level that Kevin Phillips has for large parts of his career you can’t afford to give him too much space. He maintains his composure and has an acute awareness for where he is in relation to the goal and when to shoot. If a defence isn’t conceding space to be exploited, players need to be aware of how to create space. Leading on from the last example, Kevin Phillips has recently demonstrated why he is a supreme goalscorer, especially at this level. His movement in the box is largely focused on space creation and the goals he scored against Bristol City and West Ham have similar hallmarks. 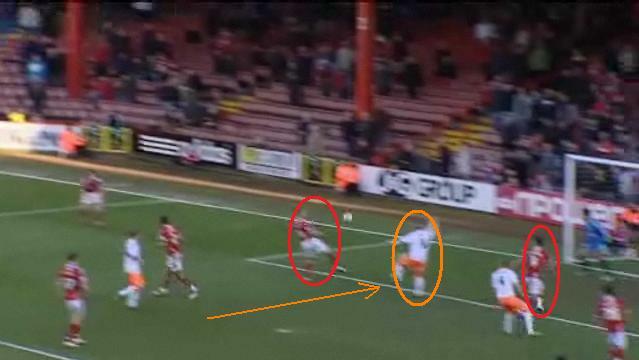 Below you can see how prior to the ball coming in to Phillips he has worked his way between the two Bristol City centre backs. Compare the picture above to the one below, where against West Ham Phillips does exactly the same. Again, he is perfectly positioned, this time in between the full back and centre back. In these cases, if the centre back fails to clear the ball then Phillips has the space he needs to attempt to score. If the delivery is poor, or the ‘keeper intercepts then the chance goes away. Unfortunately for the opposition in these cases, that didn’t happen. The only other way to thwart Phillips is for another defender to react or for Phillips to miss with his shot. Neither happened here and these are two great examples of how an intelligent striker can create space when perhaps it’s not always obvious. Space is the most critical element in most games of football. Give a footballer space and they can operate, take the space away and only the better footballers will tend to flourish. In the top leagues and competitions, this becomes more and more obvious. If Blackpool end up back in the Premier League next season then some of the younger strikers could learn a lot from watching Kevin Phillips as the rest of the season plays out.